Fault line 2009-10-28: Foot. Snow. Earth. I ran this morning toward the new fields that Philip has plowed. An inch of snow blanketed the ground. Out by his field area I noticed a cottonwood structure – not quite a ramada – that had been erected at some point. It may have been there for three years or a thousand or since yesterday. I only just noticed it. The dogs and I cut down across the wash, across the snow blanketed runnels along the bench and up to the plowed fields on the other side. The structure had no apparent use. And no apparent past or future. Much like many of the discoveries here, it seems to exist apart from time. Philip had a good year. The monsoons did not come this summer which pretty much did in most of the farmers. But not Philip. His vast field sported dense head high corn. But here is the secret. He had water. But it did not come this year. The rain actually fell in August, 2008. And it sat on top of the dense clay, creating a swamp of his field. He got nothing that year. And it took three months for the rain to perc into the ground. And then the ground froze. And when it thawed, the dense clay would not give up the moisture. Philip planted late and the corn was slow to start, but when the roots finally hit that year old moisture it took off. Philip watered his field one year in advance. And now he is plowing and preparing fields further up the wash that may not be planted for another two years. And may not produce for three. If any foundation or philanthropic people are reading this, take note. Not all environments operate on a 1 year funding cycle. Here a full cycle of rain and drought may take 10 to 30 years. A single planting cycle here may span three to five years. Time slows down. Life proceeds as it should. Not as we want it to. We must learn to let life proceed as it should. Problems arise from forcing it. We must accommodate ourselves to it. We must slow our pulse. 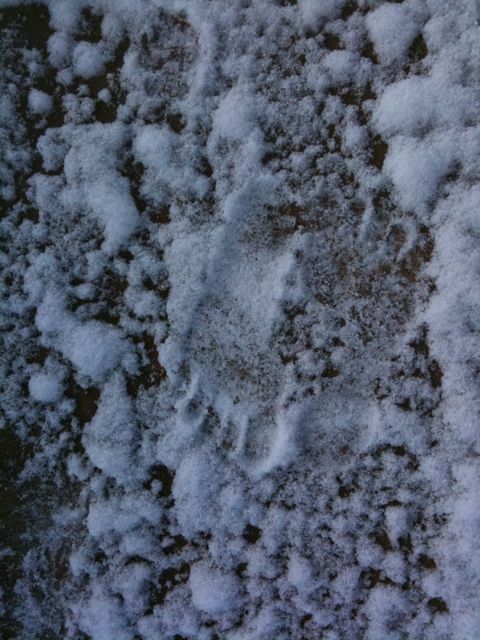 On my run, I notice footprints in the snow, the print of a human foot, complete with heel and arch and toes. I consider two possibilities. The first: at dawn a person ran before me wearing skins on their feet. 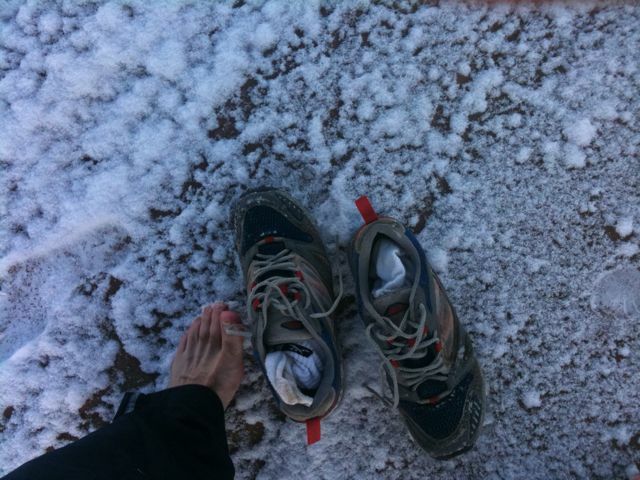 The second and even more compelling: A person in fact ran barefoot in the snow. I ponder and decide to explore the more compelling of the two. I strip off my shoes and socks. I stand on the frozen mud. 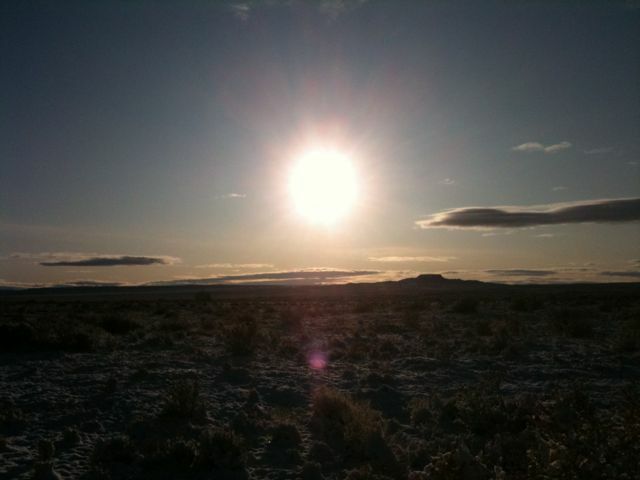 I set off running barefoot across the whitened desert. The cold instantly hardens my feet to most sensation. I feel a gentle burning pain overridden by a lightness of step. I run fast. I feel a slight bump on my heel that feels uncomfortable. I stop and find a goat head lodged in my foot up to the hilt. I cannot feel it. I pull it out and continue on for close to half a mile. Not much. Certainly not as much as some. My distant ancestors would most certainly have been ashamed. But we do what we can. If only to feel the cold. This entry was posted in Faultlines and tagged Hopi, Hopi farming, Rannie Yoo, running by Andrew Lewis. Bookmark the permalink.